The evening moon is back this week, and on Tuesday you’re likely to see a lovely grouping of the crescent moon, Venus, and Mars, all together in the west just after dark. Keen observers will notice a couple things about Venus and Mars – first, that since I first mentioned them a month ago, they’re much closer to each other, second, that Venus has grown brighter, and Mars has grown dimmer. (As a refresher, Venus is the extremely bright “star” in the west, and Mars is the red fuzzball, slightly higher and farther east). I want you to notice something about the geometry here, and without hurting your brain too much, try to think of Venus, Mars, the Earth and Sun in three dimensions. For most of us, the line between Venus and Mars is a pretty substantial angle off vertical – the severity of that angle depends on your latitude. Keep in mind that all the planets more-or-less orbit in a big flat disk, in the same orbital plane — that line, between Venus, Mars, including the Earth, the Sun (now set) and on up through Taurus (you should know how to find it after last week’s post) IS that plane. It’s the orbital disk of the solar system, and all the planets are whizzing around the sun, but from our perspective staying ON that plane as they move across the sky. The line this plane traces across the sky is called the “ecliptic”, and we’ll talk more about that later. (By the way, Uranus is above and to the left of Mars, Neptune is below Venus – So there are actually 4 planets, plus the Earth and Moon, “visible” on that line right now. Uranus and Neptune are too faint for the naked eye, though). So, now realize that Venus’s orbit is inside our own – that is, closer to the sun – and it moves faster. Mars occupies an orbit OUTSIDE our own. So looking at these two as close together as they are now, it means you’re looking along that orbital disk, seeing Venus off to one side of the Sun, and then ALL the way across the solar system past the other side of our own orbital path (or where the Earth will be ~7-8 months from now), and looking at Mars way beyond THAT. We’re looking all the way across our own orbit, and seeing Mars essentially on the other side of the solar system… it’s a LONG way from us right now (~240 million miles), and getting farther as we run away from it for the next few months – so no wonder it’s dimming. It’s strange to think that if you fast forward all the orbits, we will pass BETWEEN the two planets you’re looking at right now – but that’s what will happen. By July, 2018, we will have caught up, and be close to Mars again. It’s also interesting to note that because Venus (and Mercury) move inside our own orbit, they will never, from our perspective, venture far from the Sun. Hence Venus’s nickname as the Morning Star or the Evening Star. These two planets are also the only ones that go through a full set of phases, like the moon – right now Venus is about half-lit, but at the right times, we can see a crescent Venus, and even a “new” Venus as it transits the Sun – crossing the Sun as it passes between it and the Earth. The planets outside our orbit don’t do this – they will always be full, or very close to it, because no matter where they are in their orbits, relative to us, they are going to be fully lit by the Sun. Even if the planets didn’t make themselves obvious by moving the way they do, it’s simple observations like these, made through simple telescopes, that helped establish the true structure of the solar system. So enough of that – hopefully this little mental exercise gives you a sense of perspective on our relative places. The other interesting item I wanted to point out this week is a rock. 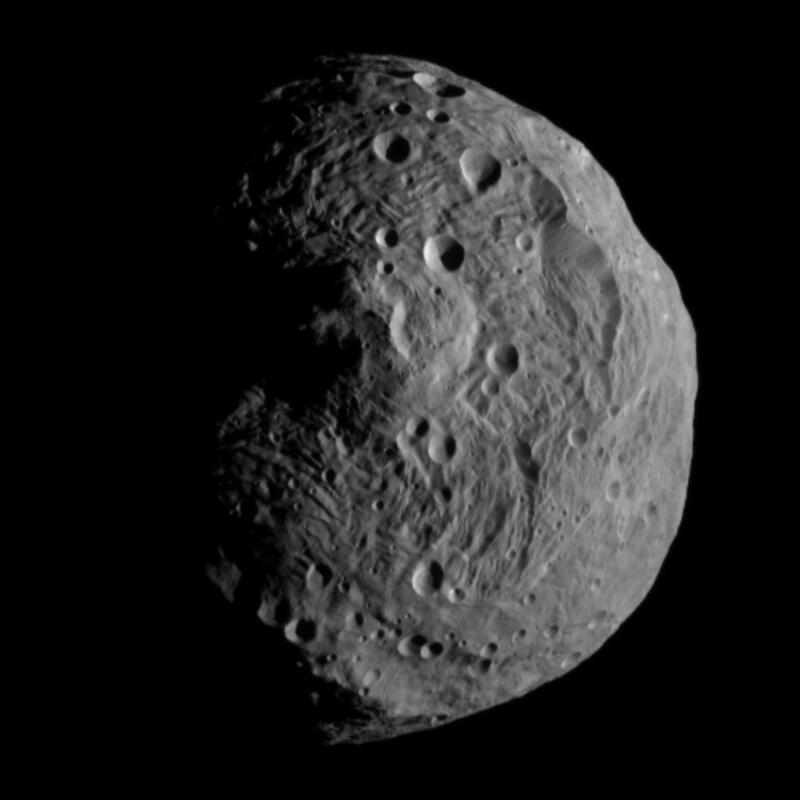 More specifically, an asteroid – Vesta, in particular. At a mean diameter of 525 km (about the distance between Washington, DC and central Ohio), Vesta is not the biggest asteroid in the main belt (that’s the dwarf planet Ceres), but it does hold the title of being the brightest, and right now it is at opposition, meaning directly AWAY from the Sun, from our perspective – akin to a full Moon, though much smaller, and much farther away. Even though it’s part of the main asteroid belt that lies between Mars and Jupiter, Vesta is MUCH closer to us than Mars is right now (only ~141 million miles), because we’re both on the same side of the solar system. It doesn’t really look like much – and without a lot of patience to notice that one dot among many slightly changes positions night after night, you won’t see anything to distinguish it from all the other points of light in the sky. BUT, if you’re a geek like me, just knowing you’re looking at an asteroid is pretty cool. To point it out, I have to describe a new constellation – but using the handholds I described last week, this shouldn’t be hard. Gemini is another easy-to-find zodiac constellation, like Taurus, and in fact is next in line after Taurus in the 12 (actually now 13!) astrological zodiac constellations. The twins REALLY DO look like stick figures holding hands – and after sunset, this time of year, they are laying on their sides – kicking Orion’s upraised arm. Their own heads, marked by the bright stars Castor and Pollux (also the names of the twins in Roman lore) are off to the left/east, one above the other. Procyon and its dim companion in Canis Minor form a line that points upward to about the twins’ knees. If you draw a line from Castor, down through Pollux, and cover about the same distance again as the distance between those two stars…. Vesta is right there. Somewhere. Binoculars may help. Like I said, doesn’t look like much, but one of those little points of light is different – you’re looking at an ASTEROID right now, and can actually SEE it! If you were to take a picture of this area every night, you’d notice one star that moved. And that’s how most of these bodies ACTUALLY GOT DISCOVERED. In fact, many didn’t even use photographs, but meticulously made hand drawings, where differences were noted – Vesta was discovered this way in 1807! After a few weeks of watching, you’d know enough to be able to predict and calculate its orbit – and from that point, math should tell you where it is at any arbitrary date and time. It’s amazing, really. So when you hear these stories about tiny near-Earth asteroids that were “near misses” that we didn’t see coming, or you hear about these amazing successes landing probes on asteroids (and comets!) think about what kind of science, observational rigor, and math it represents to find, predict, and zero in on the three dimensional trajectories of all the rocks hurtling around in our solar system. It’s astounding!